Find hotel near Danubiana Meulensteen Art ..
One of the best art galleries in this part of the world, Danubiana Meulensteen Art Museum consists of an eclectic collection of art spread across its main room as well as its adjoining park. If you want to feel inspired or simply want to see what is trending in the region, head here to get your creative juices flowing. Permanent Exhibition including the Gerard Meulensteen collection and the Danubiana collection. Works by great Dutch artists are also featured in the exhibition. The easiest way to reach the place is taking the 90 number Bus at the Sheraton hotel which will take you to the museum in half an hour. How popular is Danubiana Meulensteen Art Museum? People normally club together Devin Castle and Church Of St. Elisabeth while planning their visit to Danubiana Meulensteen Art Museum. Absolutely exceptional gallery. The view from the windows is stunning and the exhibitions were both interesting and well laid down. The only small down side is that the place is about 40 minutes by public transport from the city centre, but I can't stress enough how worth the journey is. Buy your tickets for the return trip in advance however, as there are no vending machines available on site. Apart from that, the place is pet friendly and the cafe and garden are a great place to hang out. Absolutely love this place. I found the art to be varied and so you are sure to find something you like, within the limits that this is a museum of modern art of course. It is quite serene inside and they make a great use of the space. In fact, one of the stars here is how the space is used. Big windows looking out onto the Danube are stunning in their own right. It lends a special kind of light to the artwork too. The sculpture garden is a treat if the weather is good enough to be outside. Again, the river and the garden itself are stars as much as the art. I wish I could have spent longer here - 2 hours just wasn't enough. Danubiana is world class modern art gallery. If someone will ask me where to go to see great gallery in Bratislava, I will always advice him Danubiana. 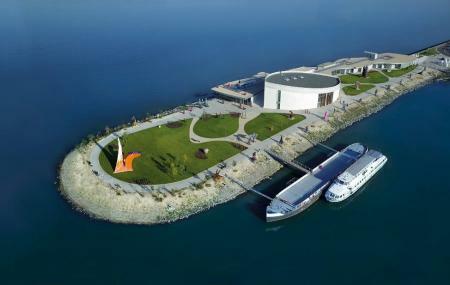 Its charming place on small penisula in middle of Danube river, if you like art/modern art you will love it! Trip is like 25-30 min from city centre, in Gallery you can spend 2-3h average. Visit its Great! A wonderful gallery on the Danube River. The journey from Bratislava central is easy enough. It takes around 45 minutes, but it is worth it. The building is architecturally superb and the displays are brilliantly curated and laid out. The cafe is also a great place to lunch - the views are sublime. I highly racommend this gallery to anyone with an interest in art. If you like art, even better modern art, that's maybe your favourite place in or better around Bratislava. If you like water, even better: much water, that's maybe also your favourite place close to Bratislava. The museum is like an island in the Danube, not far from Hungarian border, but still good connected with Bus no. 90 from city center of Bratislava. On weekend you can also go by boat there. At this point the Danube is a very wide river. In museum one part is the all time art exhibition, also with a nice sculpture park outside and on the roof of the museum building, from where you have also a nice view, when the weather is fine. Also there are always some changing exhibitions. The museum building from outside looks like a ship. Also you can go with bicycle to the museum from city center of Bratislava on the Danube bicycle road. Still one of my favourite places in and around Bratislava.